Dell have sent out some mixed signals about its small business Vostro series. There have been a few reports of company reps saying the series will be discontinued, with some devices remaining available in select markets. It is now clear that the Vostro series is here to stay – a few models are available for purchase in Europe. 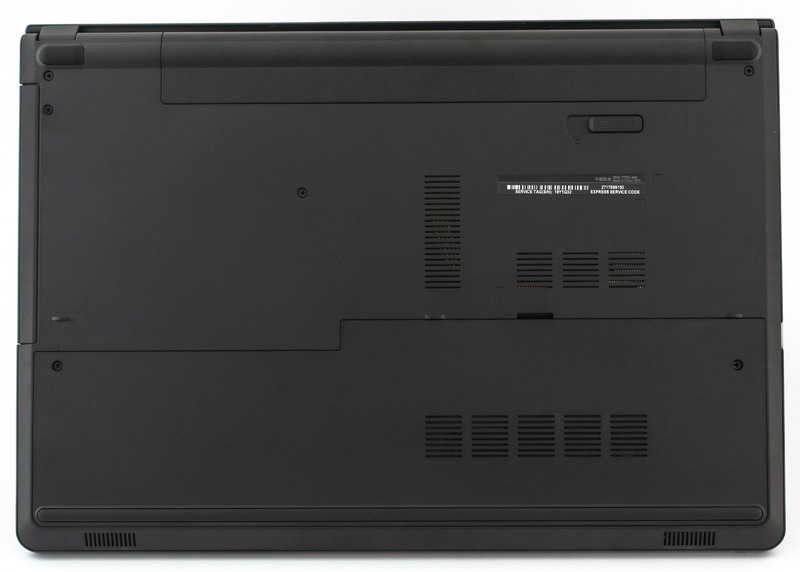 One of the new devices belongs to the affordable 3000 series – the 15-inch Vostro 3558. 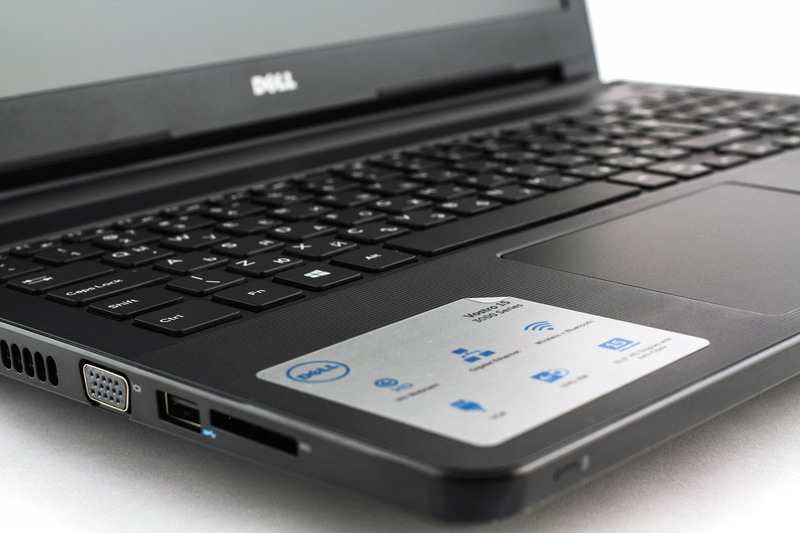 In this review we will take a closer look at this new offering from Dell. The Vostro 3558 (15 3000) features a 15.6” screen and an all-plastic build. It is an entry-level device and comes with energy efficient, ultra-low voltage Intel Pentium, Celeron, Core i3 or Core i5 CPU, up to 16GB RAM, integrated Intel HD Graphics or discrete NVIDIA GeForce 820M GPU, and up to 1TB HDD. Since the device is targeted at small business, these specs should cover most professional and business application needs. The notebook comes in a standard package, including nothing but the charger and a few manuals. 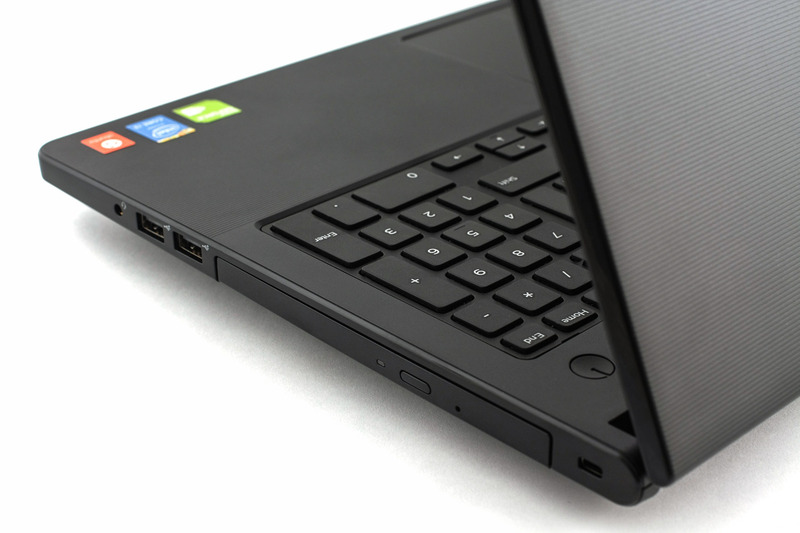 The overall feel of Vostro 3558 is in line with most of Dell’s standard business notebooks. It has a stylish design similar to the previous generations of the Vostro series. The notebook comes with a color choice between matte black or matte metallic red, and features an all-plastic build that feels sturdy, as any business notebook should. Starting with the lid – it comes with a micro-stripe textured surface that offers good grip, and also makes it harder to scratch. It does not hold fingerprints or smudges, which is a big plus. In the center of the lid we have the usual Dell logo, which in this case is glossy. On the other side of the lid we have the 15.6” screen with standard bezels, a webcam and a microphone at the top, and the Dell logo on the bottom. The sides of the device are made of glossy plastic, which unlike the rest of the device gets smudges and fingerprints quite easily. A somewhat strange decision, in our opinion. Around them on the left we have a card reader slot, USB 3.0, VGA port, the main heat exhaust grill, Ethernet port, and the DC power slot. The right side houses the optical drive along with a combo audio jack, two USB 2.0 ports and a Kensington lock slot. The front of the device only has a battery status LED to the left. When you lift the lid you are greeted by a familiar Dell design and feel. The palm rest comes with the same micro stripe texture as the lid, and there is smooth hard matte plastic around the rest of the inside. 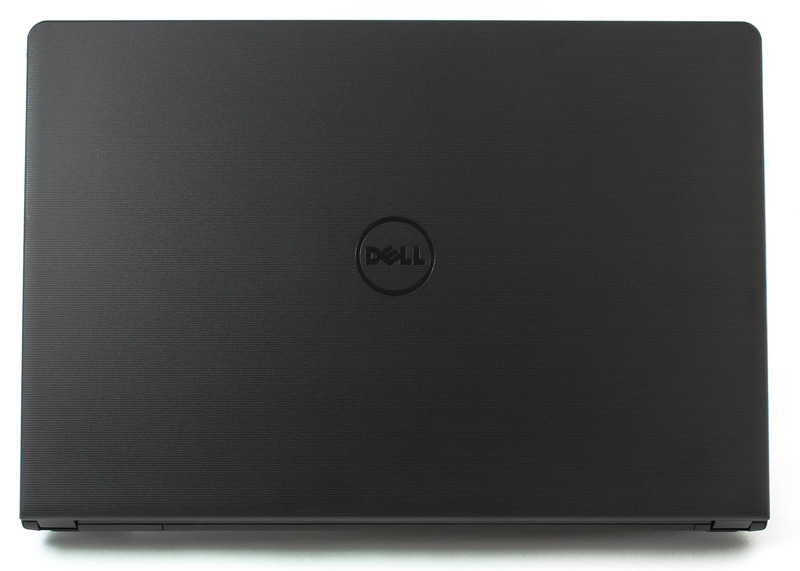 The notebook comes with a full keyboard with evenly spaced keys, the enter key is oddly small (similar to other 2015 Dell notebooks, like Inspiron 5558 and 5758). The typing experience is decent, the chiclet keys are pretty standard and offer enough key travel. Below the keyboard we have a pretty big trackpad, which unfortunately is a bit unresponsive at times, and the buttons are a bit too hard to click. Given the price, we have a pretty decent device with good clean looks and an overall sturdy build. There is some room for improvement in this budget-oriented device, our main concern being the pretty poor performance of the trackpad. 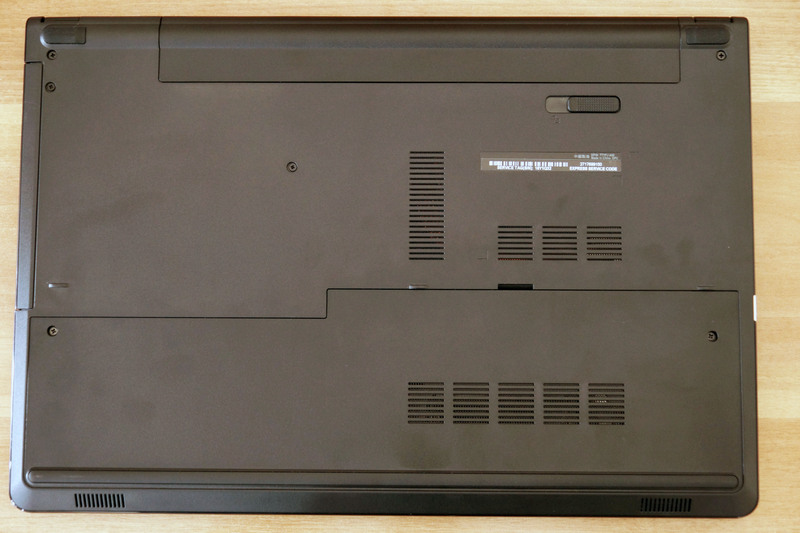 The screen of Dell Vostro 3558 (15 3000) comes with an HD TN panel with matte finish, model number NT156WH. It has a diagonal of 15.6 inches (39.62 cm) with a resolution of 1366 x 768. It has an aspect ratio of 16:9, the pixel density is 100 PPI (pixels per inch), and the pixel pitch is 0.253 x 0253 mm. The screen can be considered Retina when viewed from a distance greater than or equal to 86 cm. Dell Inspiron 5551 (15 3000)’s screen has uncomfortable viewing angles, typical for TN panels. You can see how the screen looks at 45° in the image below. The maximum brightness we measured before profiling is 235 cd/m2 with maximum deviation of just 7%. The average color temperature, measured on a white screen at maximum brightness, is 7465K – cooler (but not by much) than the optimal 6500K light. There are no unacceptable deviations. To put things into perspective we would like to give you a little introduction to the sRGB and Adobe RGB color gamuts. First up, there’s the CIE 1976 Uniform Chromacity Diagram that represents the visible specter of colors to the human eye. 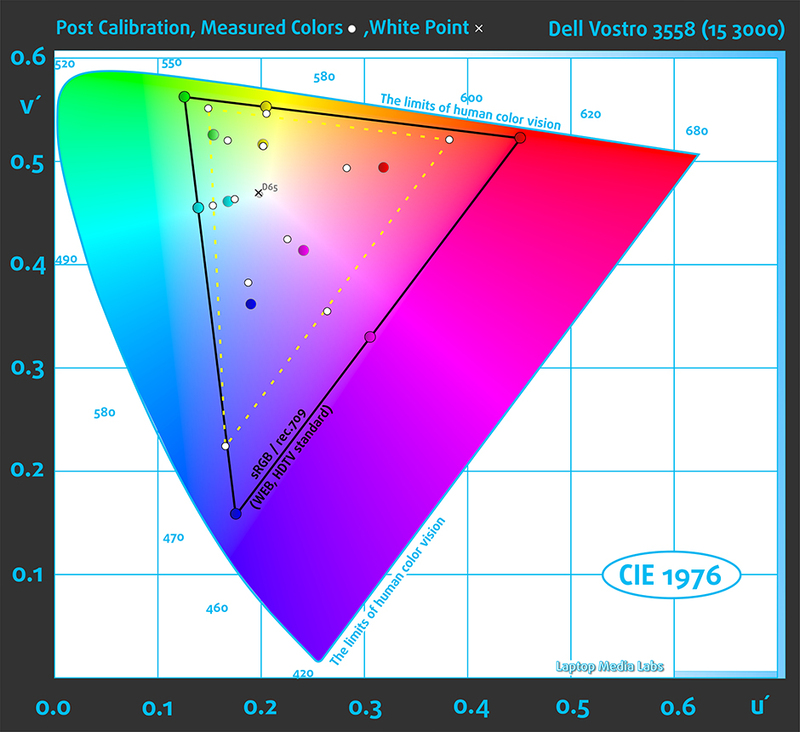 It gives one a better perception of color gamut coverage and color accuracy. Inside the black triangle you will see the standard color gamut (sRGB) that has been used by millions of people in HDTV and the Web. As for Adobe RGB, it is used for professional cameras, monitors etc., with great emphasis on printing. Basically, colors inside the black triangle are used by everyone, and this is an essential part of color quality and accuracy. 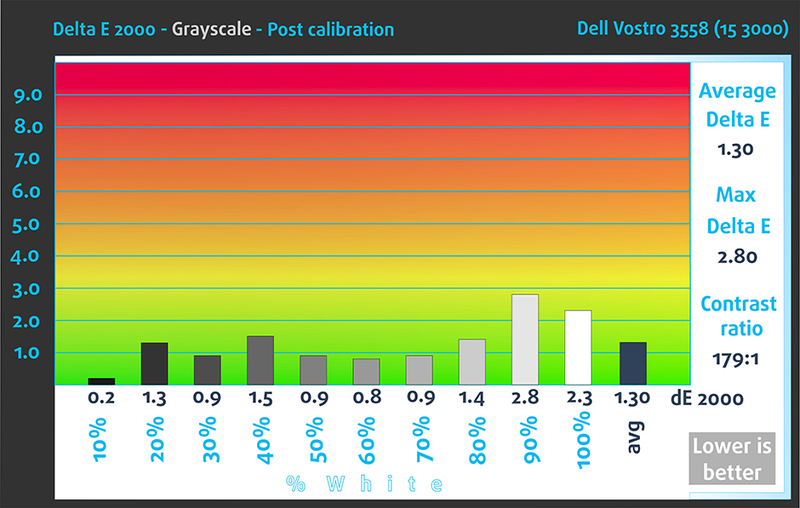 In the image below, the yellow triangle indicates the color gamut coverage of Dell Vostro 3558 (15 3000). 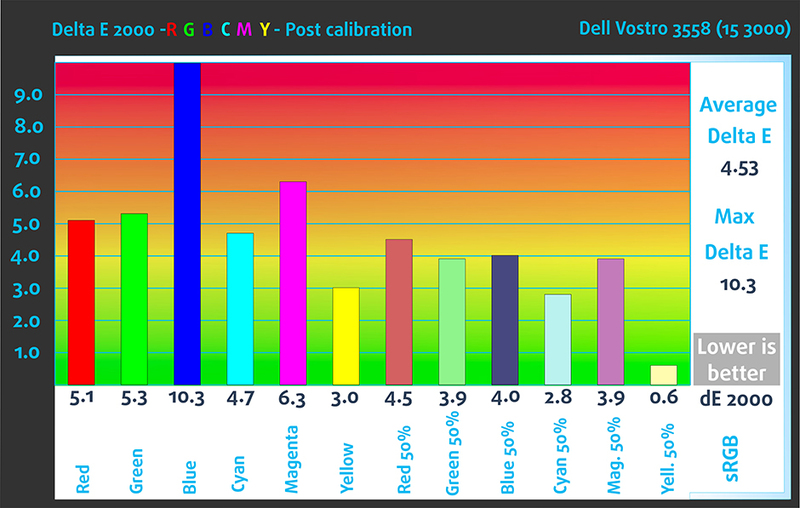 The panel covers 57% of sRGB and 42% of Adobe RGB, which is not enough for an image with fully saturated colors. The figures below show the same thing, but with added color measurements – on the left is the result before profiling at factory settings, and on the right – after profiling. The colored circles show the reference colors, which the screen is supposed to show (the target), and the white ones – the actual reproduced colors (the hits). The measurements show the primary and secondary colors with 100% and 50% saturation inside the sRGB color space. We tested the colors before and after saving the profile in Windows. Due to the insufficient sRGB coverage, some of the colors with 100% saturation (red and purple) are replaced with the closest possible option, which can lead to dull images. After profiling, the display has near optimal while level distribution. The Gamma value before calibration is 2.02, and after profiling – 2.15. We tested the display with 24 color samples, including commonly used colors, and ones the eye easily recognizes – dark and light human skin, blue sky, green grass, orange and so on. After profiling their accuracy is sufficient – average DeltaE2000 of 1.60. 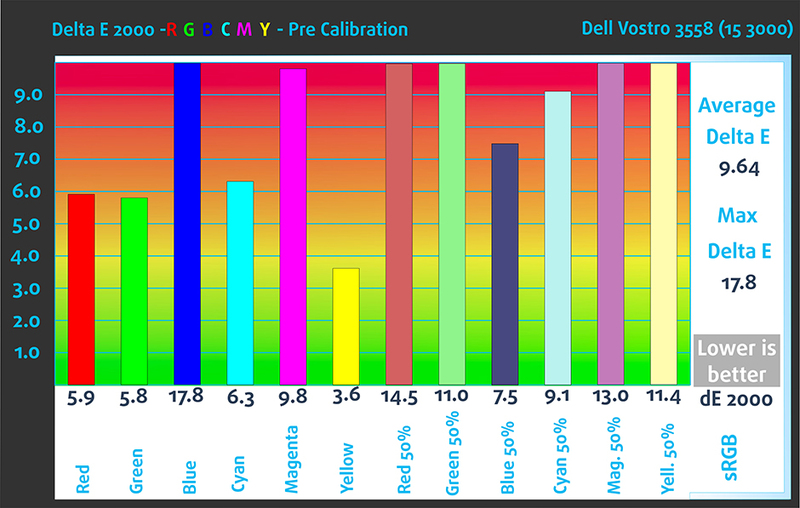 Vostro 3558’s backlight has PWM on all levels but 100%. The frequency of 1 kHz is relatively high and lowers the negative effects of the screen flickering. We measured Fall Time + Rise Time = 12.9 ms.
Dell Vostro 3558 (15 3000) has a screen that is suitable for gaming, internet browsing, watching videos or using business applications. That does not include serious color work like web design, photo editing and others which require very high color accuracy. 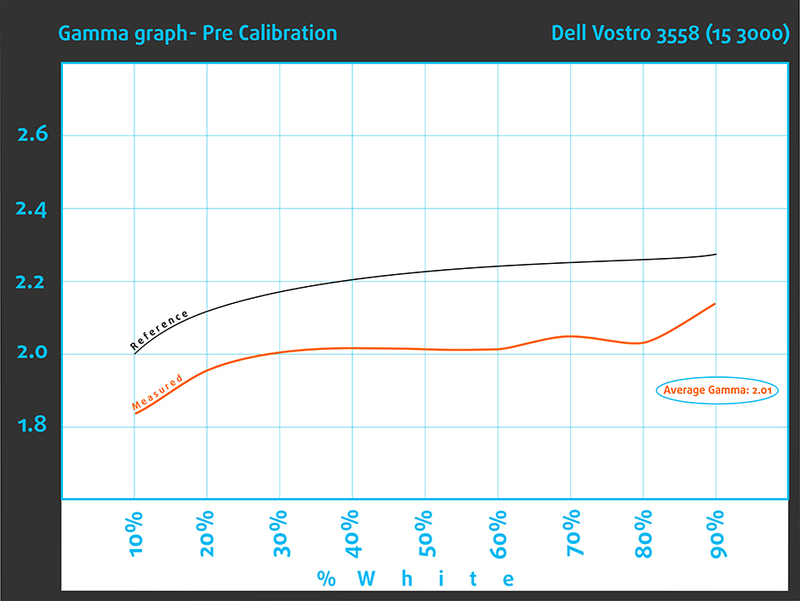 Dell Vostro 3558 (15 3000) offers good sound, although the bass could be stronger. There is a slight tinny feel to the audio, but overall, the speakers are pretty good. We expected a lot less on the sound front, given that this is a Vostro notebook. 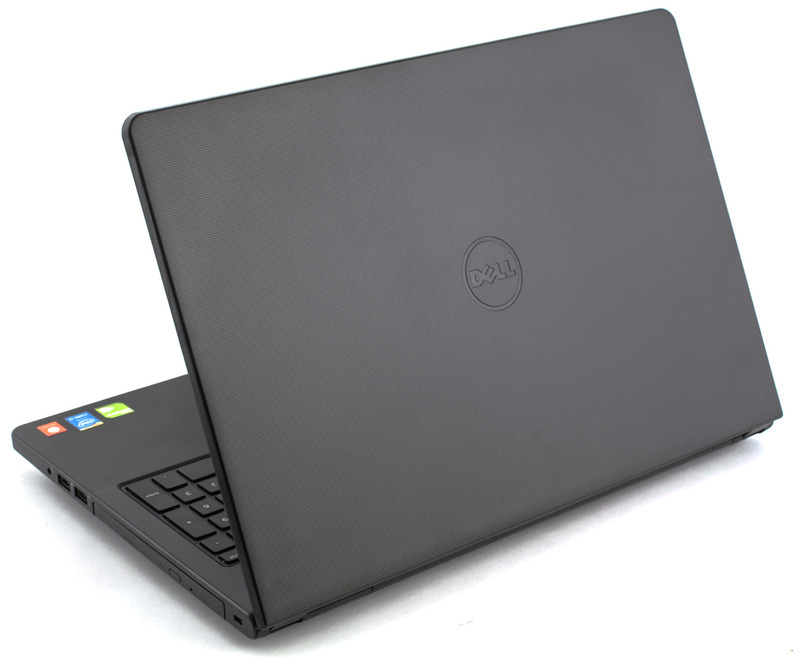 Dell Vostro 3558 (15 3000) comes with a standard 4-cell 40Wh battery that Dell uses in most of their affordable notebooks. 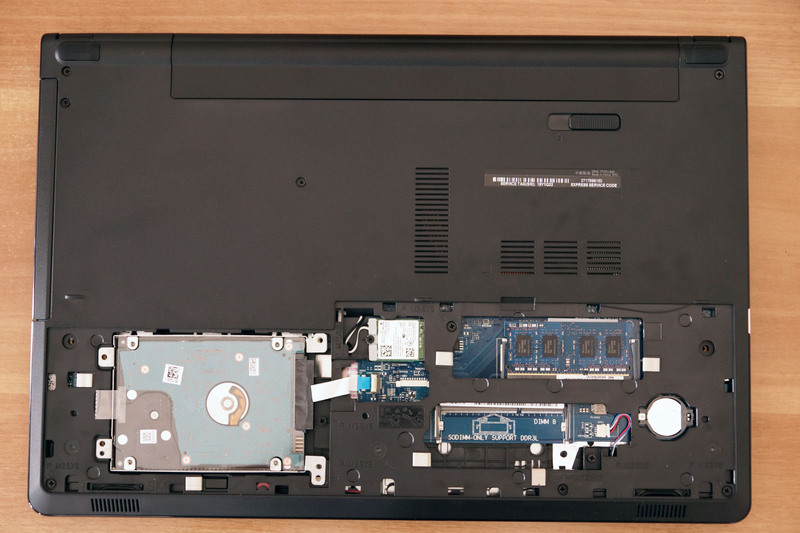 It has small capacity that is enough for some devices (like Inspiron 5551), and the energy efficient hardware should help with its performance. 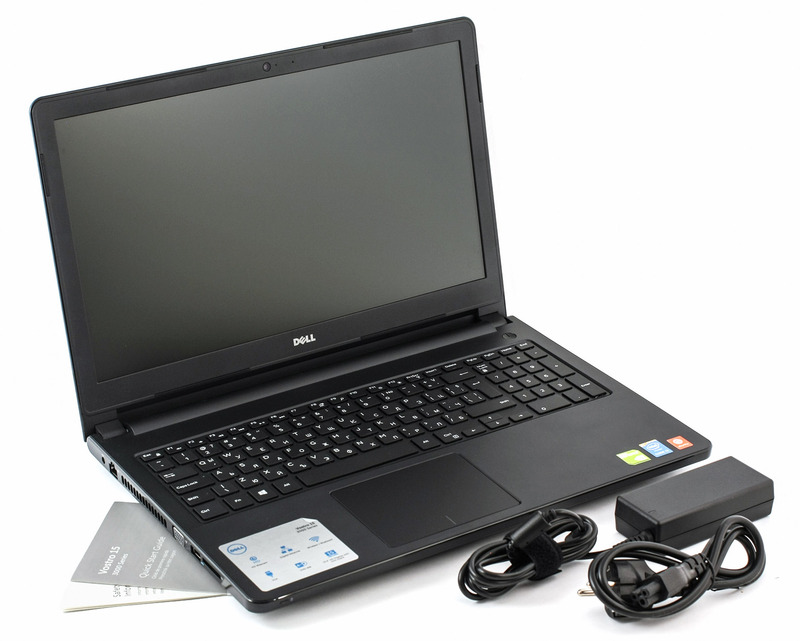 Unfortunately, it seems that Dell have not optimized the notebook as much as others, so it offers battery life similar to Dell Inspiron 5558 and Inspiron 5758 (both with a Full HD screen, Intel Core i7 CPU and the more power hungry GeForce 920M GPU). Overall, we are a bit disappointed with the results. All tests are performed under the same conditions – power saver on, Wi-Fi turned on, Bluetooth off, and screen brightness set to 120 cd/m2. We got a pretty average result of 324 minutes (5 hours 24 minutes). The result we got is a pretty round number – 300 minutes, or exactly 5 hours. Unfortunately, you won’t be able to get even a full hour of gaming – we only got 57 minutes. Intel Core i3-4005U is a low-voltage, integrated (soldered onto the motherboard), low mid-range processor announced in Q3 of 2013. It is part of the “Haswell” generation and operates at a base frequency of 1.7GHz. Unlike its “bigger brethren” of the Core i5 and Core i7 families, i3-4005U does not sport the TurboBoost functionality, prohibiting it from overclocking its cores during periods of higher loads. The chip is equipped with 128KB of first level cache, 512KB of second level cache, and 3MB of third level cache. The Core i3-4005U has been developed using a 22nm process, allowing for the integration of the Intel HD Graphics 4400 controller. It operates at a base frequency of 200MHz, while Turbo Boost can increase that to 950MHz. Power consumption of the whole system on a chip is 15 watts, with a maximum operating temperature of 100C. Intel Core i3-4005U supports HyperThreading (additional virtual core for every physical one), PCI Express 2.0, up to 16GB of LP/DDR3L 1333/1600 memory, AVX2.0 and the SSE4 instruction set. Fritz is a chess benchmark which tests the computing capabilities of the CPU with various chess moves. The Intel Core i3-4005U managed 3.401 million moves per second. For comparison purposes, one of the most powerful computers, Deep(er) Blue, was able to squeeze out 200 million moves per second. In 1997 Deep(er) Blue even beat the famous Garry Kasparov with 3.5 to 2.5. NVIDIA GeForce 820M, codenamed “N14M-GL”, is a mid-range graphics chip, announced in early Q2 of 2014. It is part of the Fermi generation and relies on a GF117 core, constructed through a 28nm process. There are 96 CUDA cores in total. The chip also has a 64bit bus and DDR3 memory. NVIDIA GeForce 820M supports DirectX 11, Pixel Shader 5.0, Optimus, OpenCL 1.1 and OpenGL 4.3. Memory bandwidth goes up to 14.4GB/sec. Max resolutions (WxH) are 1560×1600 digital and 2048×1536 analog. Before we begin with this section we would like to note that the following tests do not represent real-life situations. It is extremely difficult to reach 100% CPU and GPU load under normal usage for such an extended period of time as in our stress tests, but we run them to see how the machine handles higher temperatures, and check the overall stability of the system in the long run. First we put the CPU under 100% load for an hour. Under normal usage the CPU maintained a temperature around 48-50°C. During our computational stress test the temperatures of the device rose to about 60-63°C, which is a pretty good result and far from the operational maximum of 100°C. There was no throttling of the CPU during the entire test. You can see the results on the graph below – the blue is the CPU load, the temperature is in orange. After the first hour of CPU stress we add 100% GPU load and leave them both running for another hour. The CPU temperature quickly rose to 80-82°C and remained at that level for the remainder of the test. The GPU temperature remained around 83-85°C through the entire hour. During this test the fan of the notebook was working at full speed and there was a noticeable noise, but it was not too distracting. After the stress test we measure the temperature on the surface of the device to see if the cooling system is doing a good job. 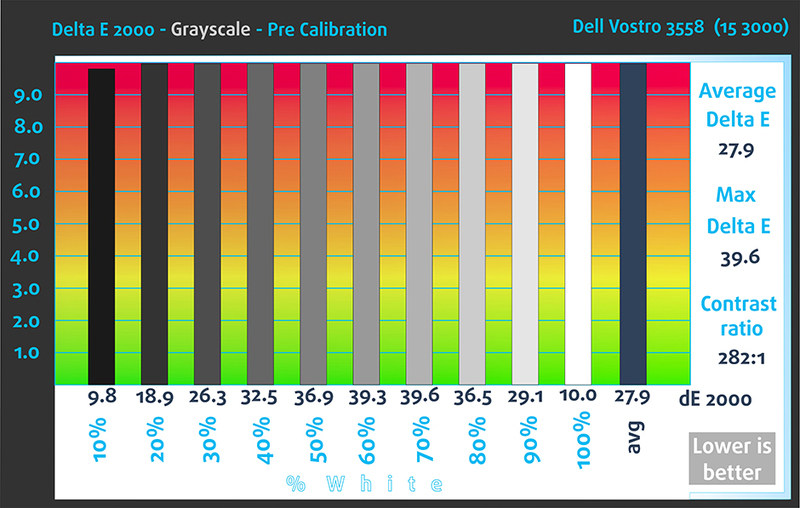 Dell Vostro 3558 did not feel too warm during the test. The top right section around the CPU and GPU was slightly warmer, but the device was still comfortable to work with. You can see the results in the image below. 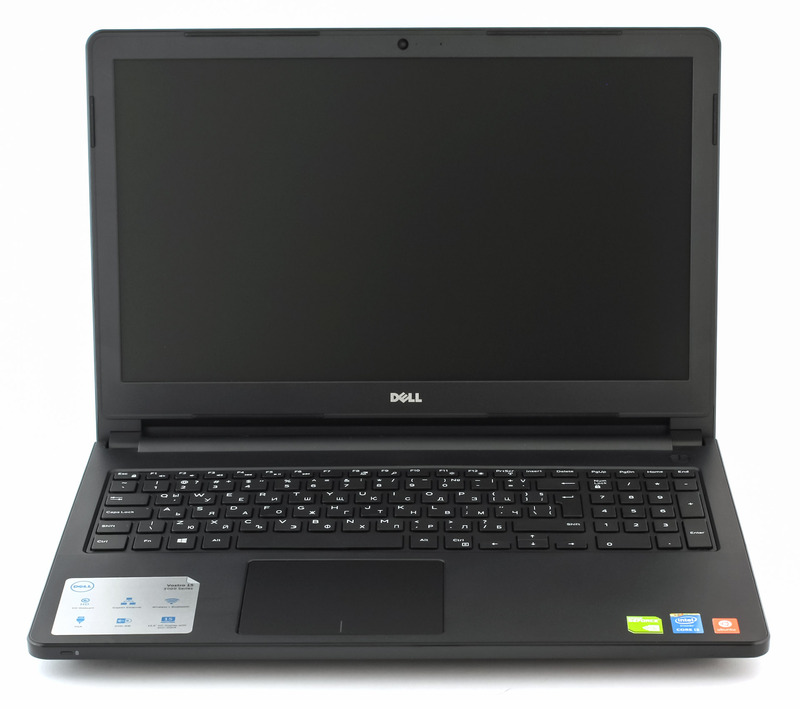 Dell Vostro 3558 (15 3000) is an affordable business notebook that is primarily set up as a working device. With the Core i3-4005U, 4GB RAM and spacious 1TB HDD it offers good performance for office tasks and business applications . The low price of the device might also be of interest to home users. 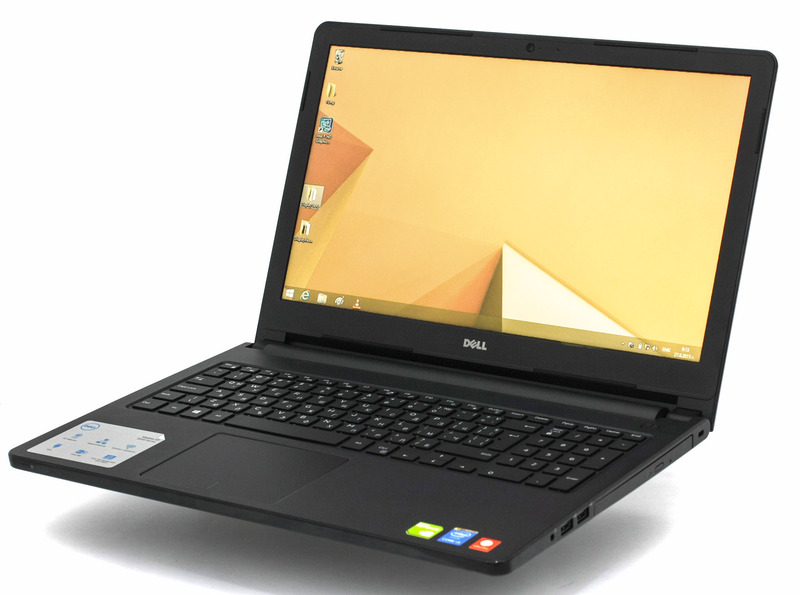 The notebook features a great clean look, it has a sturdy build. The lid offers comfortable grip, and it is hard to scratch or smudge. Unfortunately, the display is not very good – the color gamut coverage is poor, and the viewing angles are bad, but it still good enough for most office applications, as long as you don’t require exact colors for your work. The presence of PWM for nearly all brightness levels is a bit of a downside. We found it odd that the only video output is analog VGA, but some corners have to be cut when making a budget machine. The keyboard is decent and has sufficient key travel for comfortable typing, but the trackpad is lacking in performance and can be an annoyance. Battery life is decent, but we expected a lot more from the energy saving components and HD screen. 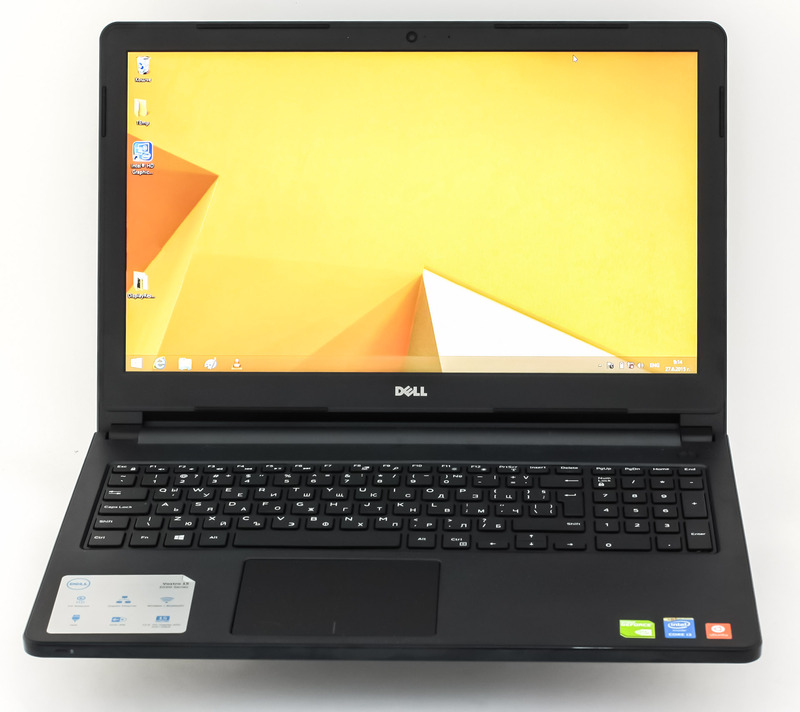 Overall, Dell Vostro 3558 is a great affordable business notebook, which can also appeal to home users with its low price and good specs (keeping in mind how much you’re spending).